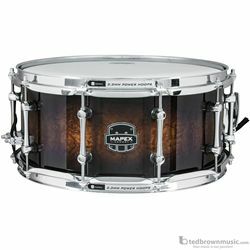 This drum is all about mass impact. With a Birch/Walnut Hybrid Shell. The Exterminator has a broad spread and a powerful attack tha your bandmates will feel in their gut. The Scream of Birch and the Punch of Walnut unite to produce a balanced blend of tone and attack. The SONIClear(TM) bearing Edge (standard on all Armory wood shell models) allows all drumheads to sit flat and tune effortlessly and respond with a stronger fundamental pitch.